It’s been a while not posting new recipes on this blog, simply because of something wonderful and exciting happened in my life and travelling back to my hometown, Hong Kong for a few weeks. Amongst all those memorable events in the trip, my cookbook sharing session is a big step forward in my blogging life that I really want to share with you all on this blog. 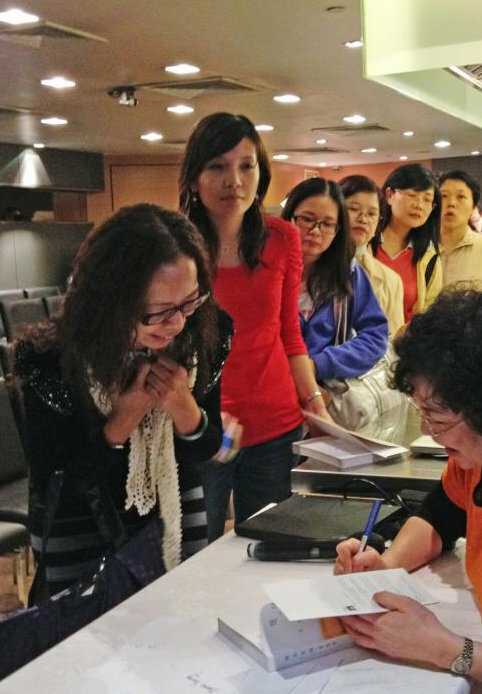 I felt both happy and humbled when seeing my fans face-to-face, running a cooking demonstration at Towngas Cooking Center in Hong Kong. The whole cooking demonstration was live streaming simultaneously so that all my overseas fans could join in. Many thanks to my publisher for arranging this event. Apart from the streaming job, my designer, Anthony took lots of photos for us. Also, I’ve got a personal photographer, my brother-in-law, Terence to go with me. Here I chose and used some of Terence’s photos of my making dumplings to create a slide show. Hope you’ll like it. 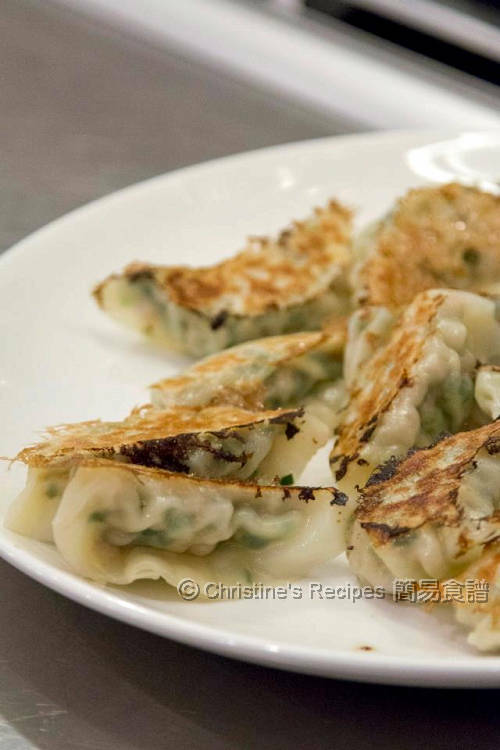 I still remember a fan asked for the recipe of homemade dumpling wrappers before I went back to Hong Kong, that I shared in my cooking session. A promise is a promise. Here you go. A friend of mine told me that if you’ve tried the homemade wrappers, you won’t go back for the store-bought. I couldn’t agree more. Well, if you’re crazily busy and want to slack off on hectic days, yet still craving for homemade dumplings, the store-bought ones are the savers. Aren’t they? Let’s go back to make some delicious dumpling wrappers. Sift flour into a big bowl. Drizzle the hot water evenly into the flour, in a slow, circular motion. Use chopsticks or a spatula to mix well quickly to create little flour crumbs. Add the room-temperature water bit by bit into the flour. Use hand to knead into a dough until the surface is not sticky. Place the dough in a greased bowl, covered with a plastic film. Let it rest for about 10 to 15 minutes. Turn the dough onto a lightly floured surface. Roll and stretch the dough out into a long strip, about 1½ inches in thickness. Divide into 20 equal portions. Roll each portion into a small ball. Lightly flatten and roll out into a 7cm-sized disc with a rolling pin. Wrap a heaped teaspoon of filling in the center. Please refer to this video. If using store-bought wrappers, you have to damp the sides of wrappers with water in order to help seal tightly. But for this homemade wrappers, you can skip this step. As different brands of flour will absorb different amount of water, thus don’t pour all the room-temperature water in one go. Keep about 2 tablespoons of water, then add bit by bit if necessary. If you find the dough is too wet, don’t worry, just add a bit of flour accordingly. If the dough is too dry, add a bit of water. For making the fillings, please refer to this recipe. Or you can use any vegetables or meat you like. The ingredients are really basic - just flour and water. But I am guessing some experience and technique is required to forming the dough. Hope I can try making my own dumpling wrapper one day. Thanks for sharing. Wonder if any idea on when you will be back to HK again and hold the same event? Glad to hear you have a good trip. Awesome videos. I didn't get the rolling part right from the book I have, your video is v helpful. Thanks for sharing. Will try again. I find the dough kneading part takes a long time, bought the kitchenaid lately and seems to give a big hand. Haven't made dumplings in a while...it's time to make some! Hi all, this wrapper sure seems simple. congrats on the book signing and looks like there was a great turnout! I'm usually lazy to make my own wrappers although I know it will taste more yummy. definitely KIVing this for one day! Btw, I tried your jap cheesecake receipe and it turned out great. May I know if I can replace the milk with whipping cream so as to make the taste richer? Yes, why not? Try the whipping cream if you like. Be sure not to get the thick one, otherwise your cheesecake will be too dense. I tried this recipe today but the skin Turks to be tough. Is it bcos I did not add enough water during the kneading? Thanks! Probable that your dough was either too dry, not enough water added or not kneaded enough until enough gluten produced. YUM! These always looked so hard - will have to make soon. Thank you! You made great use of the videos as they were very useful. Great article! hello, just discovered your great site today. I will be doing this later. By the way, do you have the recipe of Xiao Long Bao? the one that looks like dumplings but when you bite it, it is soooo juicy inside?? I will try your recipe of egg tart,too... Thanks for sharing! More power! God bless! Sorry, don't have the Xiao Long Bao recipe posted yet. By the way, do you have recipe of Xiao Long bao? the one that looks like dumplings but very watery and juicy inside when you bite it?? Many thanks! God bless you for sharing your talent! So that's why I often use my bread machine to knead dough for me. Sorry, I don't have the recipe you're after right now. Kitchen Aid 6-qt mixer is a must for bread bakers. You won't be disappointed. The 5-qt one is too small. Is it possible if I make these wrappers ahead of time and freeze them? How should I keep them from sticking to each other in the freezer? I often make dumplings ahead, wrapped fillings inside and freeze them on a tray lined with baking paper, without letting them touch each other. Once the dumplings are frozen, you can store them in a plastic bag in order to save room. It's very handy whenever you need them. 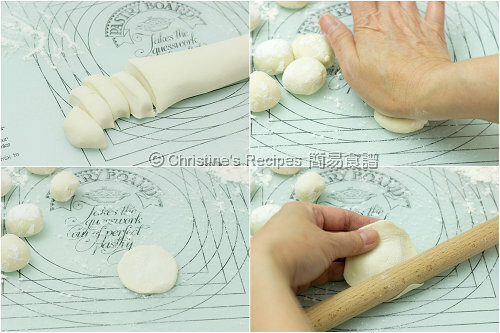 If you only make dumpling wrappers and freeze them, it's very difficult to keep them from sticking to each other. I cheat a bit when rolling the dough out... I use my pasta machine and roll them out just like I would any Italian pasta so that I get a long flat sheet. I then cut rounds with a cookie cutter (actually a large top to a Mason jar). That's a clever move using a pasta machine and cookie cutter. Like your idea. May I know whether I can use this wrapper to steam dumplings? These wrappers are for pan-frying. For steaming, there's any other formula. Very interesting recipe. Could you tell me if there is a way to mechanize this wrapper making proccess? I see many machines on the internet but they are for industrial use. How about something more suitable for a cottage industry? Thanks.